"IndexAssistant packs a huge wallop for its miniscule price tag. "—Key Words, Bulletin of the American Society of Indexers. Read the review here. 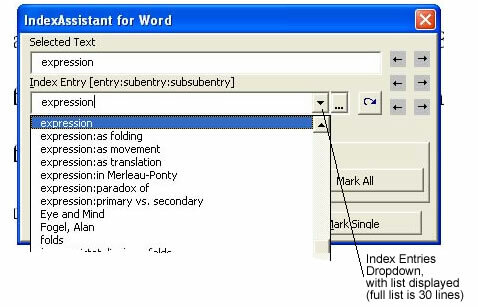 IndexAssistant is software that tremendously improves Microsoft Word’s native indexing functions. 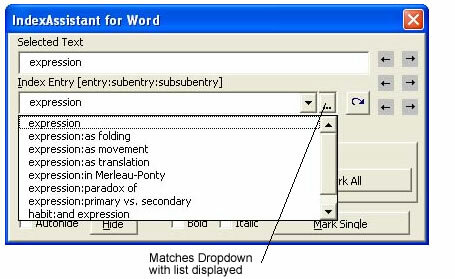 Use its intelligent and powerful interface to help you view, maintain and apply a consistent set of index entries; keep track of the structure of your index as you build it; mark ranges of pages with one click; consolidate scattered single page index entries into ranges with one click; navigate and edit index entries in your document; and maintain cross references. A tremendous time and organizational saving over Word’s own interface when it comes time to index a manuscript. With the help of IndexAssistant, authors can use a fast index turnaround strategy. Construct, check and proof your index in your Word document—before you receive your galleys. When you receive your galleys, insert page breaks in your Word document so that its pagination matches that of your galleys. 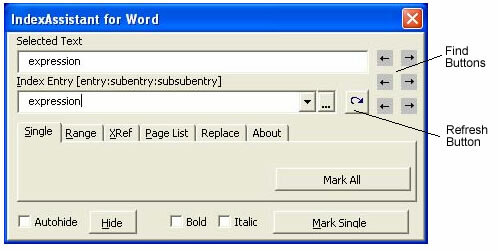 Then have Word regenerate your index. Your turnaround time can be as little as one day, from your publisher’s point of view. With the help of IndexAssistant, professional indexers who do embedded indexing in Word can realize immense gains in speed and ease of use. See the screenshots, list of features below and manual for more details. IndexAssistant is shareware. It costs $10. Requires Microsoft Word 97 or higher. If you intend to use IndexAssistant on an ongoing basis, purchase the full version through this website. IndexAssistant maintains an alphabetized list of all index entries in your document. IndexAssistant’s autocomplete function lets you quickly and intelligently reuse entries from that list. Increase your speed and consistency in indexing. Always have an overview of your index, which is not possible with Word’s native’s functions. Mark a range of pages for inclusion in your index…with ONE click. An immense speed saving over Word’s native functions in which this procedures takes nine steps, many clicks and keystrokes…and remembering bookmark names across different dialogues. Page list function to list all occurences of a given index entry and navigate amongst them, a function that is simply unavailable in Word. Search and replace functions for helping inspect and edit your index. Consolidate function for cleaning up your index, by combining scattered single page entries into one page range. A great convenience and time saving for refining your index, a procedure that would be tedious with Word’s native functions. Keeps cross reference entries organized and alphabetized. An organizational feature that helps you manage your index. See the manual, especially the quickstart guide to get an idea of how easy it is to use these features.